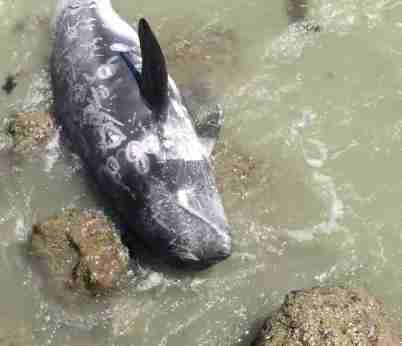 You can help stop the Taiji dolphin hunt and save animals like him. Taiji, Japan, is a bloodbath once again - and a heartbreaking video captures the final moments of the hunt's first victims. 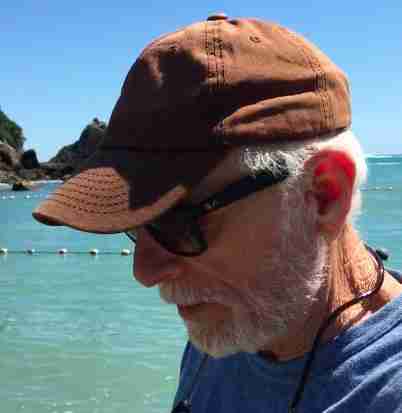 Ric O'Barry, founder of The Dolphin Project and star of the 2009 film "The Cove," was in Japan to witness the first days of the Taiji dolphin hunt last fall. And an encounter he had with one of the victims left even a veteran like him shaken. 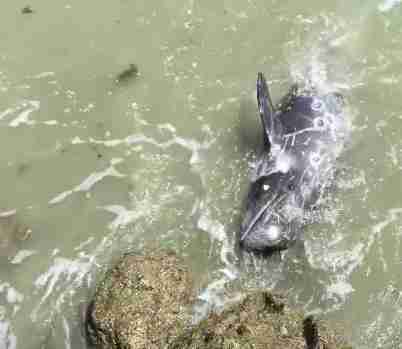 In a video, a panicked family of Risso's dolphins is shown swimming frantically around a tiny sea pen, having been herded from the deeper waters into the makeshift slaughterhouse. They swim up and down the enclosure, tangling themselves in the netted walls as they seek to escape - a few swim beneath the nets but end up on the side close to shore instead of the open ocean. One stricken animal, overwhelmed by fear, seems to intuitively recognize a friend. He throws himself on the rocky shore at O'Barry's feet, desperately thrashing and rolling onto his back as he tries to escape. O'Barry is equally stricken - but he can't do anything to help. "I will be arrested immediately," he says. "The police are all over the place." 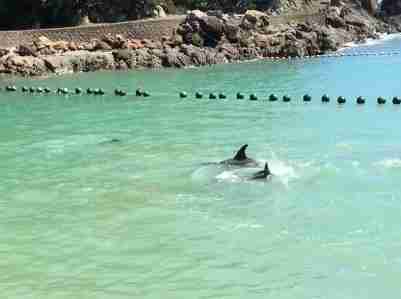 Activists are only allowed to witness the hunt, not interfere - if they do they will be immediately arrested, risking lengthy prison sentences, and no one will ever see the true story of Taiji. "This is anguish," O'Barry says, crouching down by the tragic scene. "[He's] panic-stricken on the rocks, and I am heartbroken that I can't get in the water and help him away from ... he's tearing his skin up. This is awful." Release does come - but in the worst way. A boat of fishermen slowly makes its way over to the beached animal as O'Barry watches over him. 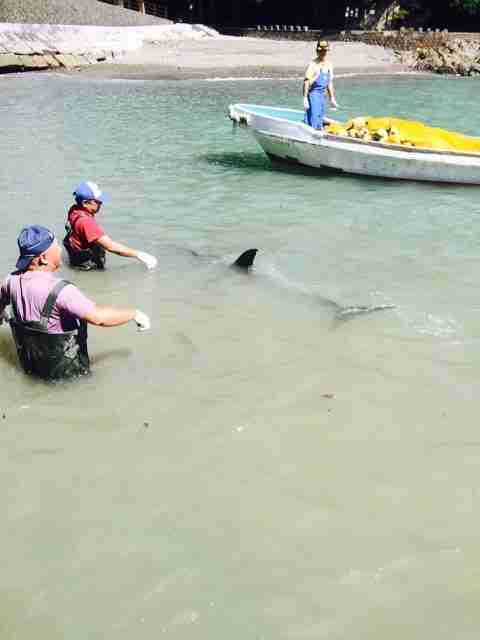 When they arrive, they roughly grab the dolphin by a fin, pushing him out into the water - but the animal can barely swim. "That dolphin's not going to make it," O'Barry says. "He's given up." A few moments later the frightened dolphin, unable to take any more, sinks down to the bottom. A few moments a later, another boat pulls up carrying a man in a full scuba suit. "They're sending over a diver," O'Barry says. "Probably with a knife to take him out." It's unclear whether the dolphin died of fear or whether the fishermen finished him off, but, as O'Barry turns away, it's apparent that, even after witnessing so many deaths, he's shaken by the incident. "It breaks my heart," he says. "This is so stressful. This is so difficult to witness. I almost got in the water. I almost got in the water and maybe I should have." "I guess I blew it," he adds, turning the camera off. Each year, 20,000 dolphins are slaughtered in Japan, hundreds of them in the Taiji hunt alone. The few who survive the blood-red waters are sold into captivity, fated to spend the rest of their lives cut off from family and performing at zoos and marine parks. But as this video shows, the suffering of even one of those dolphins is enough to spark outrage. And while proponents of the hunt market the massacre as a Japanese tradition, dolphin drives have only become commonplace in the last few decades - and the Taiji hunt in particular is driven by a handful of local men who are getting rich off the killing. "These are the cruelest 50 men in the world right here," O'Barry says. "Shame on the captivity industry for not being here and doing something about it." "They don't represent the Japanese people," he later adds. You can help stop the Taiji dolphin hunt by donating to The Dolphin Project, signing a petition or even traveling to Japan with the group's cove monitoring program. Visit The Dolphin Project to find out more. Watch the touching video below (there's nothing graphic, but the content could be upsetting).